GRANTS PASS, OR--(Marketwire - Sep 15, 2012) - The entire month of October, National Breast Cancer Awareness month, Dutch Bros. Coffee will be selling pink "Be Aware" travel mugs and donating proceeds to breast cancer screenings for women who are uninsured or underinsured. Mugs cost $12 and include your Dutch Bros. drink of choice. All Dutch Bros. locations in seven states will be participating. To find a Dutch Bros. near you, visit www.dutchbros.com/locations. Regular screenings are instrumental in detecting breast cancer early on, when it is easier to treat and before it is big enough to feel or cause symptoms. Dutch Bros. Coffee donated $1 million in 2011 to nonprofit organizations and causes. Founded in Southern Oregon in 1992 by brothers Dane and Travis Boersma, Dutch Bros. Coffee is the country's largest privately held, drive-thru coffee company. The company has nearly 200 locations in Oregon, California, Washington, Idaho, Nevada, Colorado and Arizona. Each store serves a large variety of specialty coffee drinks made with a premium, private three-bean blend and roasted fresh daily. Dutch Bros. Coffee was recently ranked by J.D. Power and Associates as highest in customer satisfaction compared to other coffee companies in its 2012 Specialty Coffee Retailer Satisfaction Report(SM). Dutch Bros. Coffee and its franchisees employ over 1600 people who all embody the Dutch Bros. philosophy of, "Love all, serve all." Dutch Bros. Coffee gives back 1% of gross sales to the communities it serves. In 2011, the company donated more than $1 million to nonprofit organizations, including local food banks, the Muscular Dystrophy Association, American Cancer Society and Boys & Girls Clubs of America. Dutch Bros. Coffee is headquartered in Grants Pass, Ore. To learn more about Dutch Bros., visit www.dutchbros.com, www.facebook.com/dutchbros or www.twitter.com/dutchbros. 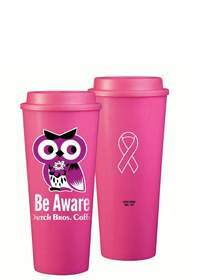 Proceeds from sales of Dutch Bros. 'Be Aware' travel mugs, pictured above, will go toward breast cancer screenings for uninsured and underinsured women.